I started playing the guitar at the age of 14, and by 19 had started to teach. Over the next few years I taught locally, recorded CDs and played in many local bands, in front of audiences of between 5 and 5000 people. In the year 2000, I released my first CD, and reached the final of a national guitar competition, eventually finishing 4th. This taught me a lot about playing under real pressure, as I had 24 bars of music to impress Vinnie Moore! In 2006 I joined Jazz Funk outfit "Dimitri" and also started the "Conrad Harpham Trio", an instrumental rock fusion outfit. The Conrad Harpham Trio are currently playing in venues in the South of England, performing concerts and technique workshops. Later that year with the trio, I was awarded the "Outstanding musician" award, at the Devon County Battle of the bands competition, and for the last 2 years I have received top 15 finishes in the international competition "Guitar Idol". 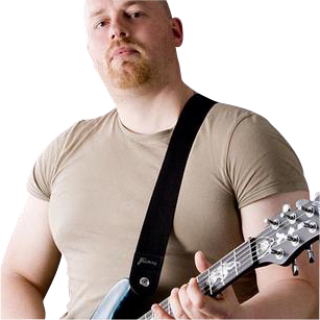 I am currently a busy tutor and performer in the South West of England, and in 2008 completed my sixth recorded CD, "Conradical" which was described by Cross Rhythms magazine as a "Mesmerising display of solo electric guitar at its finest". Shortly after the release of this album, I signed as an international endorsee of Framus Guitar Company. In the 90â€™s, I was greatly influenced by the likes of Van Halen and Randy Rhoads, but my greatest influence of all was Joe Satriani â€“ a man who combines great technique, with tone, tune and suitability. I currently enjoy listening to Richie Kotzen and Satriani, and am influenced by anyone who can do something new and refreshing on the guitar! I am great believer in the "P" word â€“ practise â€“ but not without structure. You can spend hours fiddling on the guitar with no real progress or learning taking place. A structure to each second of your routine is vital. The lessons at GMC provide you with this structure, to formulise your own practise routine, and to take your playing forward, whatever style or level you are. I am really looking forward to sharing some of my ideas with the community at GMC, and am eager to learning some new ideas from the other tutors and pupils. I am also a great believer in developing your own style, using ideas and licks from others, but then defining your own unique way of presenting music and playing your guitar. Most of all though, enjoy the guitar, it is a wonderful instrument!